Tradewinds RV Center is one of the top RV dealers in Michigan and the country, thanks to our sensationally low prices, huge selection, and great financing options! If you've got your eye on the 2020 Forest River Flagstaff Micro Lite 25LB Travel Trailer, we can make that dream a reality! So stop on in today and don't miss out on another summer of wonderful family fun! We're conveniently located at 4325 W Vienna Rd Clio Michigan 48420 and we've got the RV of your dreams just waiting for you - at a price you won't believe! Even if you're only passing through, or live outside the Clio area, we can still make it happen! Don't live in Michigan? That's no problem, either. Give us a call at 810-686-0710, and with our fast, 24/7 store-to-door delivery service, we'll put you in this Travel Trailer faster than you can imagine - and save you $1000s, as well! Don't wait, talk to us today! 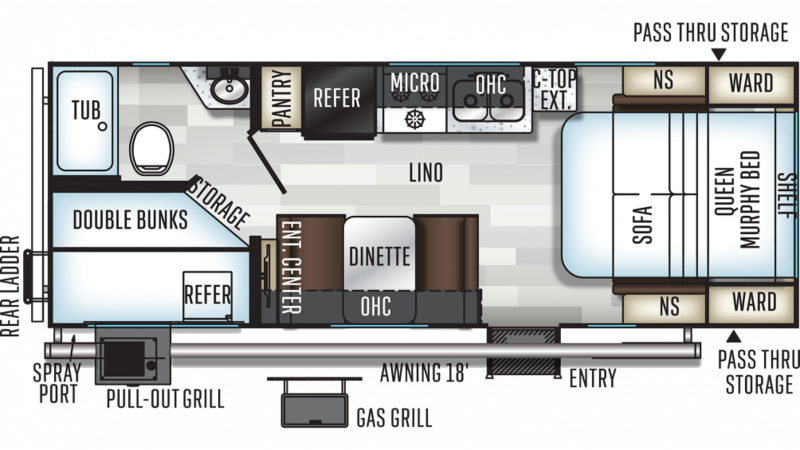 There are so many great sleeping accommodations in this RV! For the kids, they'll love the cozy bunkhouse with its cool Bunkbeds! Not only will they have their own sleeping space, but they'll have a place of their own to chill during the day! What's tastier than a meal made outdoors? You'll whip them up every day if you want to, thanks to the handy outdoor kitchen! So at the end of the day, don't let the outdoor fun stop!